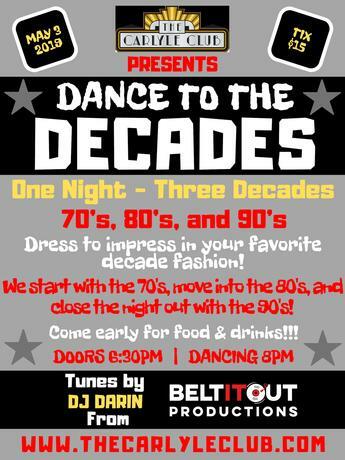 "Dance to the DECADES" - Darin from Belt it Out Productions will be back at Carlyle to DJ/MC and deliver an incredible night of music and dancing vibes covering THREE DECADES of memorable tunes and vibes! Right at 8pm, the dance party will launch with some groovy, funky, disco-inspired jams from the 70's! Earth Wind & Fire, Donna Summer, Bee Gees, KC & The Sunshine Band, and many more! After you've got your 70's on for awhile, here come the 80's! Madonna, Prince, Go Go's, Michael Jackson, Def Leppard, Duran Duran, and tons of other flashback retro 80's songs to dance to. Then, we close out the night with the 90's - TLC, House of Pain, Notorious B.I.G., Britney, Spice Girls, Will Smith, Nirvana, Boyz II Men, and a bunch more!!! Grab your friends, get your tickets, throw on your best fashion from your favorite decade, and come ready to dance for "Dance to the DECADES".